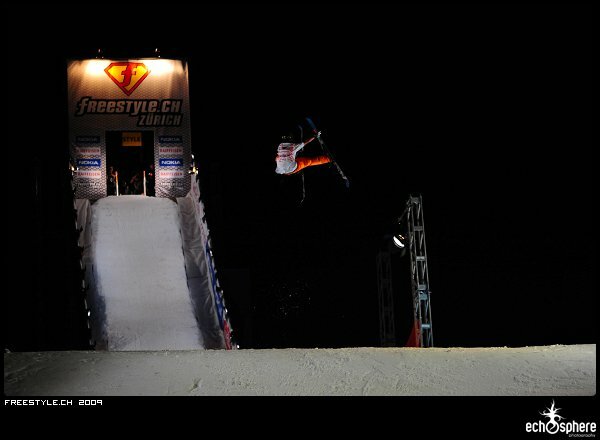 Freestyle.ch 2009, it&rsquo;s here, it&rsquo;s now. What&rsquo;s it going to be like? As for what we know right now, the format hasn&rsquo;t changed much, there are still two titles to be earned: freestyle.champ and crossover.champ. Freestyle.champ is awarded by a panel of judges to the best athlete in each sport. 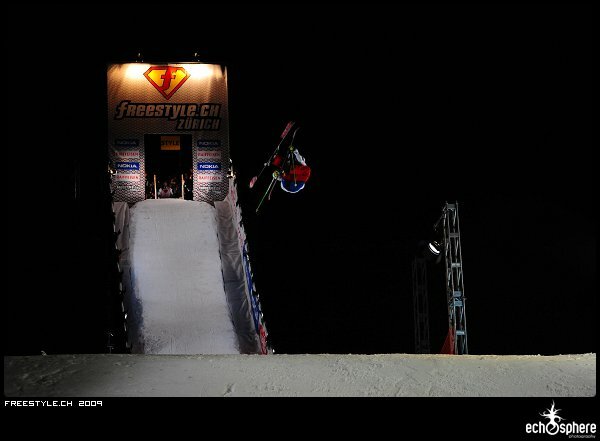 There are four sports competing: freestyle ski, snowboard, FMX and skateboard &ndash; whereas crossover.champ is awarded by the crowd to one athlete overall. 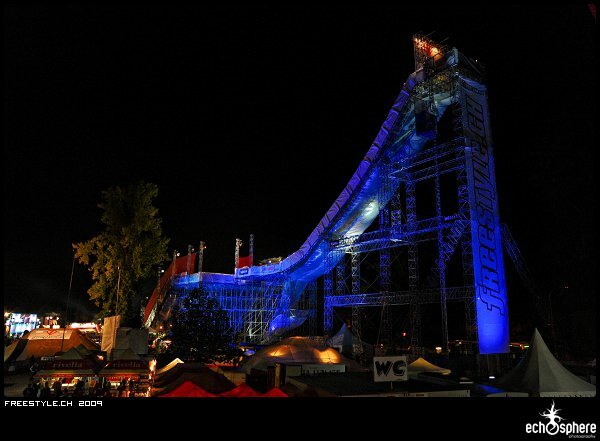 We also know that the big air is culminating 32 meters above the ground, eight meters lower than last year. We have also heard from Martin Misof that the kicker is smaller and the time in the air is shorter. Quite a few of the people we saw last year have returned, however the procedure for creating the start lists has been refined this year: the kids from Pontresina Elementary School in Switzerland were assigned this demanding task. The day started off with some warm-up jumps while the FMX competition was going off nearby. At the very least, the guys seemed to be having fun and we saw an early 1080 from TJ, although the landing was a bit hard. -the rider can decide which of the two runs he wants to redo when he has a go for the third time. This run replaces the previous one of the category the rider has chosen. Before he&rsquo;s able to end his explanation, Andri Amb&uuml;hl has reached the kicker for his first run. 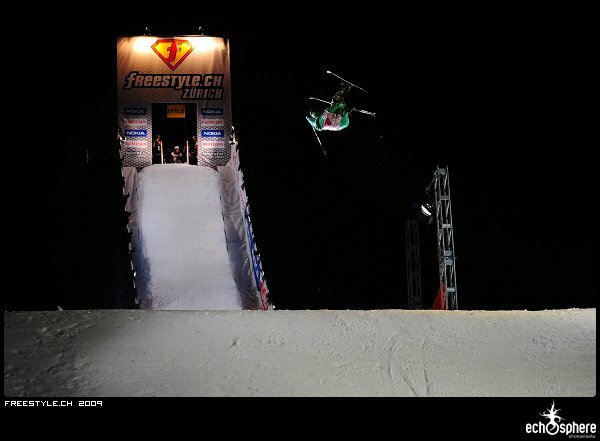 He&rsquo;s followed by Martin Misof dropping a smooth switch 720 high mute. Henrik Harlaut is up next, before the next of the two Swiss brothers competing, Elias Amb&uuml;hl. His rodeo 540 double grab gets the crowd really pumped. Colby West follows with a flatspin 360 japan and we are already past half of the style runs. Time flies and Andreas Hatveit, winner of the 2008 X Games slopestyle is up. He&rsquo;s got a score to settle with this event since he was not able to compete last year due to an injury sustained in a fall. At this point it is well worth mentioning that both of the Swiss guys, the Amb&uuml;hl brothers are in the lead&hellip; Can the only French guy competing tonight beat them? Well Laurent Favre answered that by taking second place! Three riders remain, Russ Henshaw, Bobby Brown with a switch cork 5 guitar grab and TJ Schiller with his signature flat 540 bow and arrow. While waiting for the scores, he takes the time to tell Nico Zacek and the crowd that he has learned a new trick for the technical run. After the crowd&rsquo;s overwhelming reaction to hearing that the only two Swiss guys competing tonight are in the top four, it was time for the technical run, which started off with Andri Amb&uuml;hl dropping a switch bio 900 mute to japan which got the crowd and Nico Zacek pumped. Martin Misof then dropped in with a switch 1080 high mute grab, a trick which won him the title of freestyle.champ here three years ago. And yes, he took the lead. Henrik Harlaut was up next and dropped a bio 900 mute to japan, which then put him in the lead. But then Elias Amb&uuml;hl took it away from him with the help of a 1080 high mute. At this point, Henrik Harlaut is second and Martin Misof is third. After Colby West&rsquo;s run, Andreas Hatveit dropped in with a double cork 1080 high mute and took his turn at the top of the leader board. Laurent Favre&rsquo;s attempt at his well-known switch 720 screamin seamen ended with a hard fall. After he was back up, Russ Henshaw dropped in with a double cork 1080 high mute to japan which was immediately followed by Bobby Brown&rsquo;s version of a double cork 1080 high mute. TJ then launched his new trick, and what do you know, it&rsquo;s a double cork 1080 high mute so well executed that he took the lead. After being reminded by Nico Zacek not to take the lead away from Swiss riders in front of a Swiss crowd, he made his way back to the top of the in-run. There was barely any time to even look at the scored when Andri Amb&uuml;hl took his second stab at the technical run. His switch 1260 mute, while very impressive and crowd-pleasing, landed him in seventh place, pushing him out of the finals. Martin Misof then went with his second attempt at a style run, but the fall on the landing unfortunately didn&rsquo;t help him much. Up next is Henrik Harlaut who decided to redo his technical run with a kangaroo flip. Then Elias Amb&uuml;hl&rsquo;s switch double cork 1080 high mute as a technical run got him first place on the board, but not by much. The crowd is pleased to see one of the locals still in the run as for now. Colby West then dropped in with a switch misty 900 mute for a technical run, followed by Andreas Hatveit with a cork 720 for a style run, which immediately brought a change at the top of the board. Nico Zacek once again made a point of jokingly reminding Andreas not to throw a Swiss guy off the top of the score board in front of the local crowd. 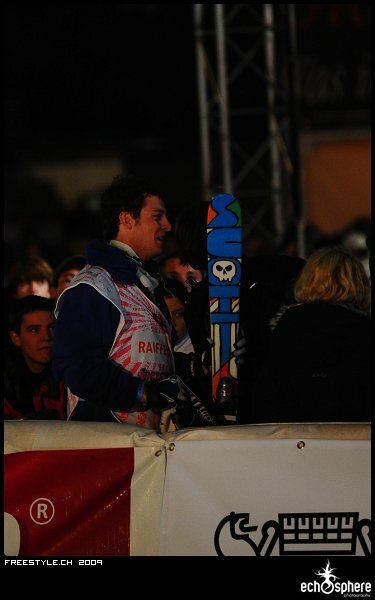 Laurent Favre then attempted his switch 720 screamin seamen, which he stomped with great success this time. He took fourth place, pushing Henrik Harlaut into to fifth and out of the finals. Russ Henshaw was up next with a style run, followed by Bobby Brown with a 720 nose grab for his style run. This however did not convince the judges enough to put either of them into the top four (the first four get to the finals on Sunday, remember). TJ Schiller then dropped in last with a bomb: a double cork 1260 for a technical run, taking first place from Andreas Hatveit. All in all, this was a very good first day of qualifications and I&rsquo;m sure that tomorrow&rsquo;s riders are already quite anxious after seeing what these guys have thrown down tonight. To sum it up in the words of one of the judges, three years ago the competition was much easier to judge, since there were about four riders that stood out clearly above the rest, but tonight, we saw so many awesome tricks and such a good level that the judging has gotten almost impossible. 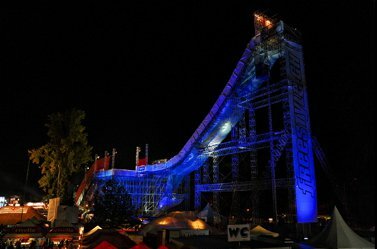 Stay tuned to NS throughout the weekend for more coverage from Freestyle.ch including the second round of qualifiers later today.